Angela Faustina’s BLACK MISSION FIG oil painting on canvas. I am always interested in discussing custom painting orders. Email me at Angela@AngelaFaustina.com to start the conversation! Commissioned paintings are the best way to add a unique, personalized painting to your art collection — without the worry it will be snatched up by another art lover! I truly enjoy working with personal and corporate art collectors to create something special. Each painting is specifically designed to fit their criteria, budget, and collection. The first step in my commission process is a discussion. Collaboration is important to determine the parameters of the project, including subject matter, color palette, dimensions, medium, style, and feel of the painting. This step is crucial so both the buyer and myself have a fairly clear idea of how the finished painting will look. Pricing is based on the parameters discussed in our initial conversations. Generally, commissioned pieces are priced slightly higher than similar paintings of the same size available for sale in my galleries and studio shop. This is due to the additional time and effort to consult with and update the art collector and create a very specific work. In addition to the conversations that occur before the project starts, I send email updates with photographs of my progress throughout the painting process. In person or Skype studio visits are always fun and possible to schedule instead! Shipping is an additional charge for medium, large, and extra large paintings. 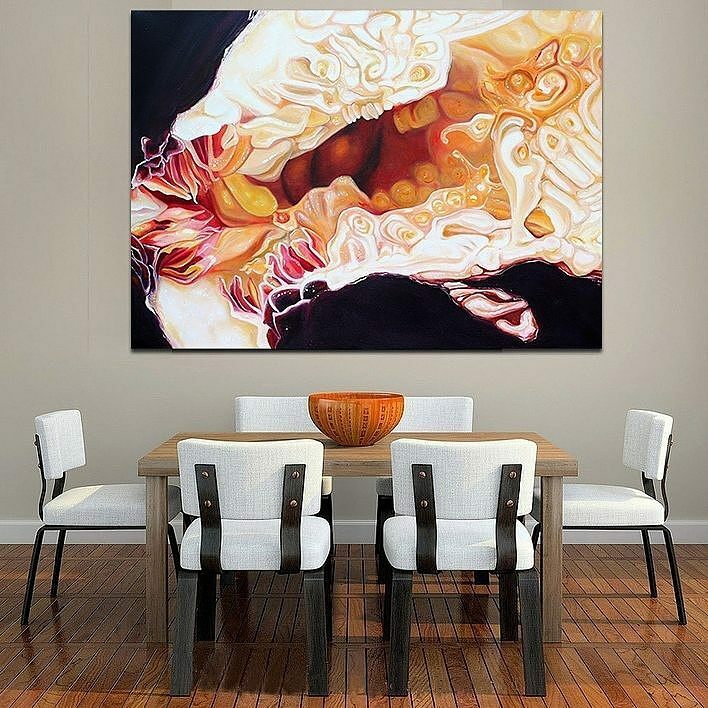 Pomegranate V (73), oil painting on canvas, 66.25″ by 60″, is currently available for $7,000 through gallery43. Custom paintings generally take 8 – 12 weeks to complete. I always let collectors know during our initial discussions if I anticipate it will take longer to complete due to its size or my studio schedule. If a collector wants the painting more quickly, it might be possible to reprioritize my schedule to finish a commissioned painting in less time for an additional fee. Once all details are finalized and verbally agreed to by both the client and myself, I email over an invoice. There are no surprises and the invoice spells out the details we already discussed very clearly. I require a 50% non-refundable deposit before I begin a custom painting. When a painting is completed, I send photographs of it for the collectors final approval. It is then shipped to its new home after the invoice is paid in full. It can also be viewed and picked up at the studio or personally delivered to collectors local to the greater Atlanta, Georgia, area. It is important to note that if there is a specific painting of mine a collector adores but is no longer able to purchase, I can reflect the concept, colors, style, and subject matter in a similar way while still creating an original work of art. However, I pride myself on the originality of my artwork and so I will never create exact duplicates or glicee prints of my original paintings. In addition, I always want my customers to be thrilled with their purchases. If I do not think I can execute a buyer’s vision, I try to suggest other artists who will be a better fit for the project or galleries who can point them in the right direction.